Compressors are an essential part of every industry, but what’s the difference between a centrifugal vs reciprocating compressor? Both reciprocating and centrifugal compressors are valuable in the manufacturing world. Their use depends greatly on function, location, and environmental considerations. Deciding between which to invest in requires research and careful study of a system’s needs and a good understanding of operating conditions. Understanding how and why they are different can assist in making an informed decision. For the most part, the difference between reciprocating and centrifugal compressors lies in their construction and style of operation. Quantity, pressure, and style of engines can also contribute to differences between the two. Let’s take a closer look at the many ways reciprocating compressors and centrifugal compressors are different. Reciprocating Compressors: How Do They Work? Reciprocating compressors can be found in wastewater treatment plants or systems for which single-stage processes are appropriate. Because they consist of one stage, they are easier to stop than centrifugal compressors, and can be installed more quickly. Reciprocating compressors can also work in a minor vacuum as long as air does not leak into the system. When a gas-driven reciprocating compressor is experiencing failure, operators are usually warned by easily discernible symptoms. Reciprocating compressors are piston-driven; they work and look similar to combustion engines. When a reciprocating compressor is activated, gas injected into the piston’s cylinders is compressed as the pistons reciprocate. The engine can consist of two to six pistons per cylinder, depending upon horsepower demands. The gas which is produced by a reciprocating compressor is either fed to a pneumatic system or immediately stored. In general, they are less reliable than centrifugal compressors, although not by much, and they can usually be repaired quickly with common tools and parts. Their deliver time tends to be shorter as well. Centrifugal Compressors: How Do They Work? Centrifugal compressors are designed for large capacity systems. Their high horsepower and relatively lower weight mean that while they might consume more resources, they can be suitable for manufacturers looking for a more compact compressor. Centrifugal compressors are generally classified as turbocompressors and tend to offer a narrow operating range. They are designed to work in several stages. These dynamic compressors pull in air to their centers with radial blades. Kinetic energy, which can also be stored by the process, is then produced; this is then converted to pressure. Between these stages, moisture which accompanies rises in pressure is removed from the system, and the air is rapidly cooled. Centrifugal compressors operate on a constant pressure, and personnel must tend to their external environment to ensure efficient flow. Due to these elements, centrifugal compressors are typically used in gas and oil extraction and production. They are also found on jet engines. The technology which powers centrifugal compressors dates to the 1940’s, so, since the trial-and-error phase of testing the scientific principals which drive them are well past, centrifugal compressors tend to be more available, more reliable, and less prone to maintenance needs. Despite their smaller size, centrifugal compressors tend to be used in industrial applications rather than in the home. 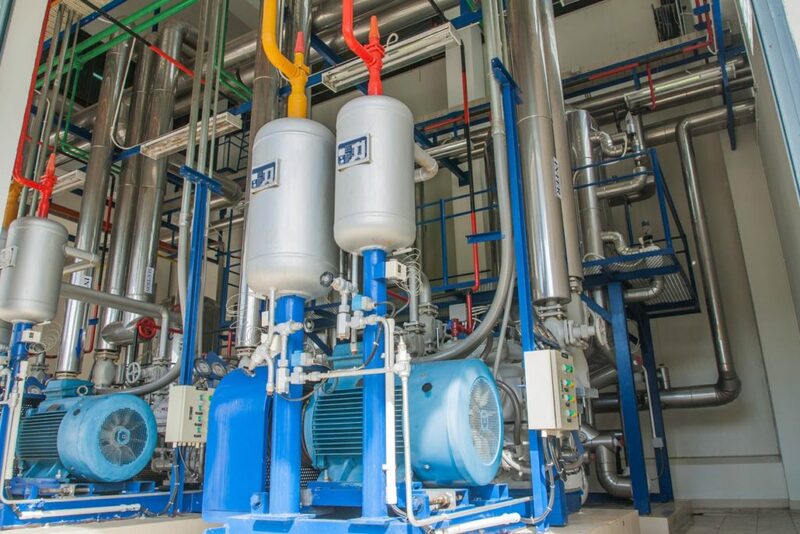 Many factors enter into the efficiency of reciprocating compressors, including their programmed piston speed, valve flow ratio, and amount of molecular weight. Usually, in centrifugal compressors, efficiency can be compromised by mechanical problems or leakage within the system. Reciprocating compressors usually operate with better isothermal efficiency. This means that the ratio of energy expended to isothermally compress any gas compares favorably to the amount of work done by the system. When the compression efficiency in a system is greater than two on a reciprocating compressor, it operates at greater efficiency than a centrifugal compressor. On the other hand, if the pressure ratio is less than two when a centrifugal compressor is in use, its efficiency is higher. Because of the way both compressors are constructed and operated, their mechanical efficiency is different. For instance, although reciprocating compressors are easier and cheaper to repair, their mechanical efficiency is lower because they are built partially of sliding parts, which, because they are also large, tend to experience a great deal of friction. Centrifugal compressors usually require specialized parts which are typically not readily available, but, because they do not operate on large panels which slide, they do not require as much maintenance as their counterparts. The maximum and minimum flow of centrifugal compressors is affected by its choke point and surge (or amount of system resistance and ambient environmental conditions), and usually performs well at flow rates below300 m3/h. For reciprocating compressors, maximum as well as minimum flow is directed by the size of its cylinder, as well as the amount of cylinders available. Because reciprocating compressors run intermittently and with air which pulsates at a high pressure ratio, they handle a smaller volume of air than centrifugal compressors. Reciprocating compressors, because of their multistage operation and low discharge, can invite cracking and potentially affect the health of their operators due to their greater noise and vibrations. At the same time, centrifugal compressors are better suited for low pressure and high discharge; they are designed to work continuously at a steady rate. The pressure ratios for reciprocating compressors run between five and eight; centrifugal compressors are between one and four. The operating pressure of a reciprocating compressor is well-matched to systems which can work with a wide band of changing pressures. They are more flexible than centrifugal compressors, which present a small pressure ratio. Centrifugal compressors are not very flexible and are generally not a good option for workforces with high turnover, as they are usually considered specialized equipment and can incur higher insurance costs. Now that you understand the pros and cons of a centrifugal vs reciprocating compressor, you can make better decisions regarding the parts and health of your compressors. KB Delta can provide compressor parts for your compressors. Contact us today.